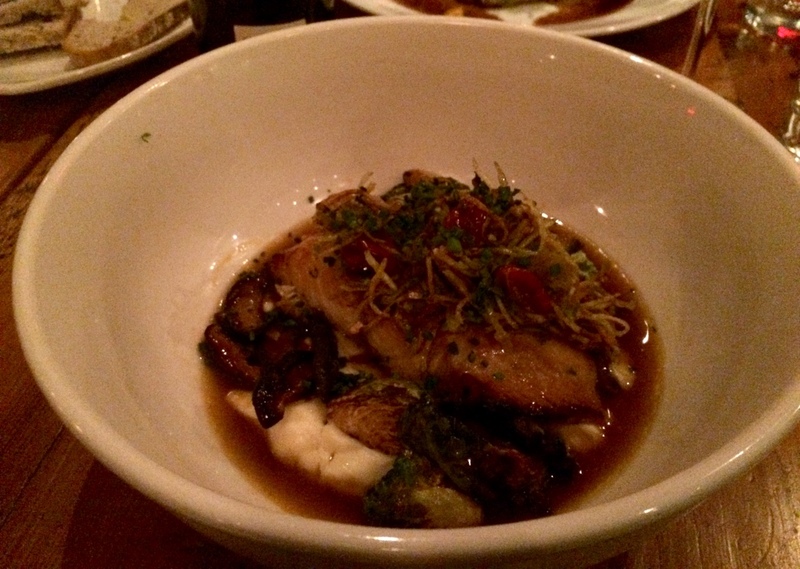 Sel Gras – Cosy Mile end bistro that deserves a try – Montreal restaurant | Everything Delicious. Although located in the heart of the Mile End, right next to famous foodie spots like the Lawrence or the Sparrow, Sel Gras has always been a little bit more under the radar, most people ending up here by chance or because the line up is too long elsewhere in the hood. After giving it a try (a little bit by accident as well), I do think this upscale but casual bistro deserves to be given a chance as part of your Montreal restaurant trials. The food wasn’t all consistent, some dishes being better than others but overall we ate well. 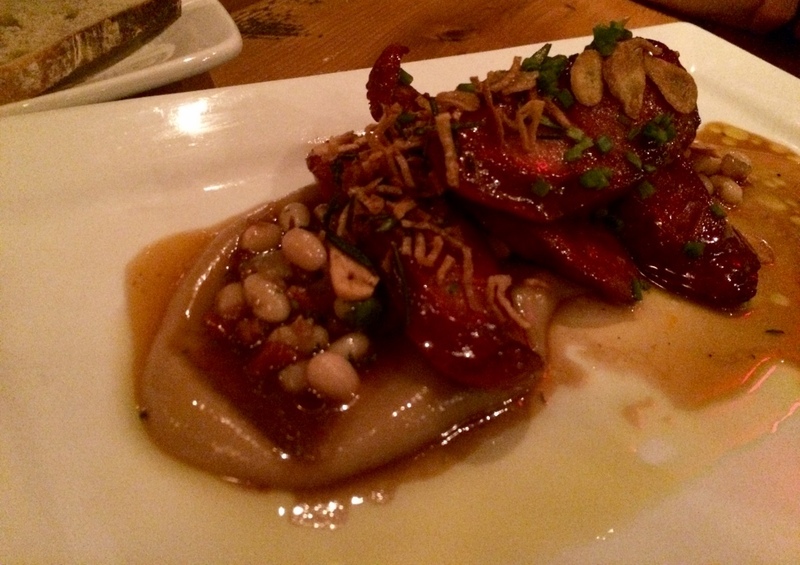 For starters, we had a delicious chorizo plate which was generously served, nice and crispy, accompanied by a white bean purée and grilled onions. Absolute yumminess. We also tried the octopus which was definitely less successful. Not only was the octopus a bit chewy but it was also served with a really overpowering red bean puree which killed the chance you had to actually taste the octopus itself. The pastry on top also felt a little unnecessary. I love octopus and so this felt a bit like a let down unfortunately. The mains all did a better job to deliver on our expectations. 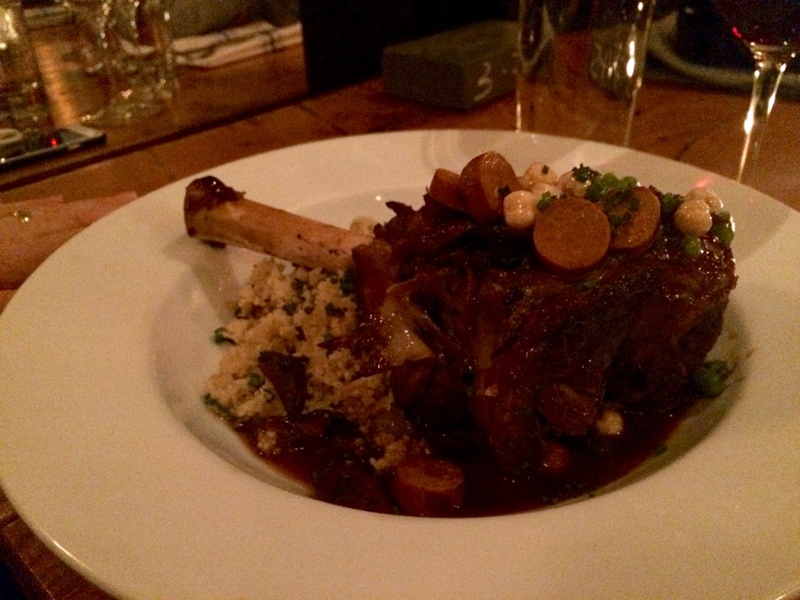 The least interesting of all was maybe the lamb served with couscous and veggies. There was nothing wrong about it but it wasn’t particularly revolutionary either. If you like lamb and want a satisfying portion this is definitely a valid option to consider however. 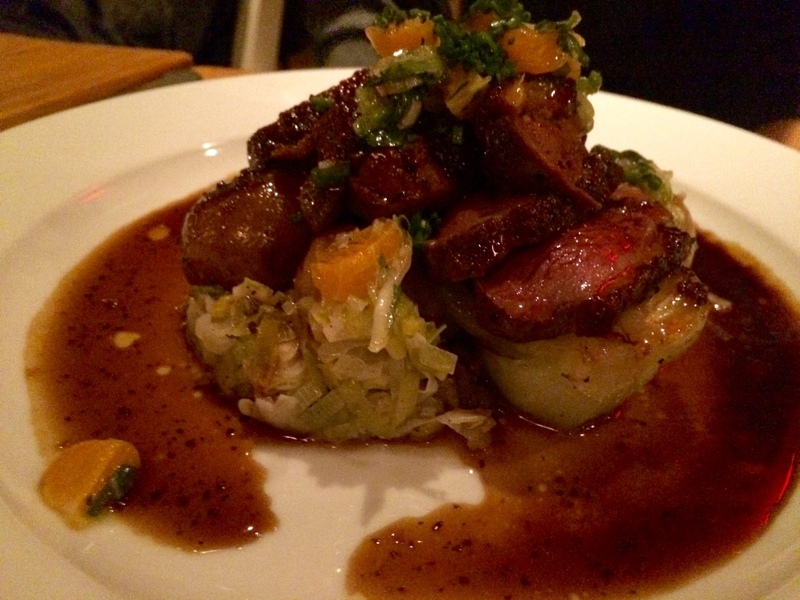 For a more interesting choice, you can try the duck breast served with red wine sauce and clementines on a bed of leek. Very nice balance of flavours in this plate. And if you fancy something lighter (although still well served) try the black cod. The delicious miso & tamarin sauce gave the cod a nice asian flavour and the whole plate was well balanced. The vibe is casual chic I would say with nice wooden tables dressed simply. No fancy white table clothes in here. The service we received was really good, efficient and polite. Another plus is that Sel Gras participates in the new Tab Payment app system which means you can leave as soon as you are done eating, paying through the app. Not need to wait for the waiter! A plus which reflects how modern and progressive the management is in this place. We had a good dinner all in all and plates that were well executed were well worth a visit. Let’s hope they improve some of the dishes that deserve a bit more refinement and then it would be a sans faute. I also heard they have a cheaper lunch menu that has a good reputation and a brunch option that seems to be well-rated. So definitely worth another try. 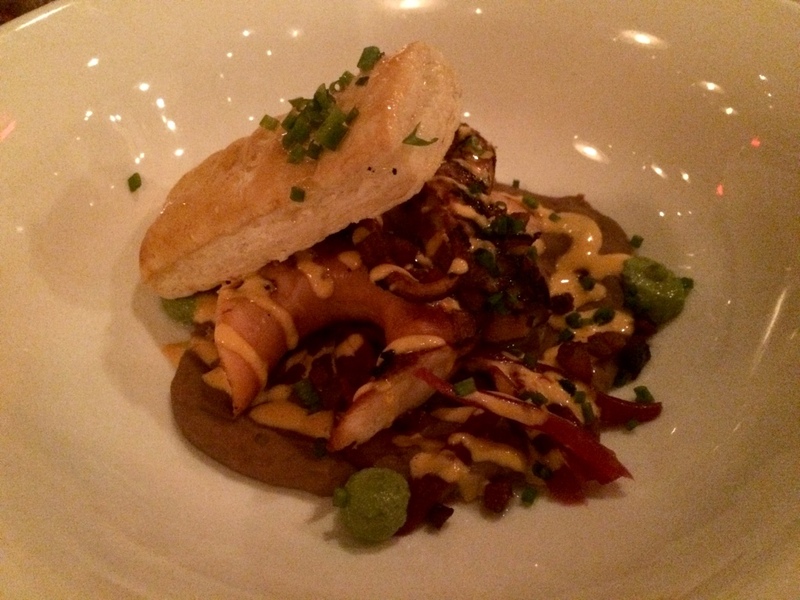 This entry was posted on April 27, 2016 by Pauline Rosen in Restaurant feed and tagged bd St Laurent restaurant, bistro, chorizo, cod, cosy bistro, duck, food, fusion, lamb, mile end, montreal restaurant, octopus, restaurant mile end, restaurant montreal, Sel Gras, tab payments.